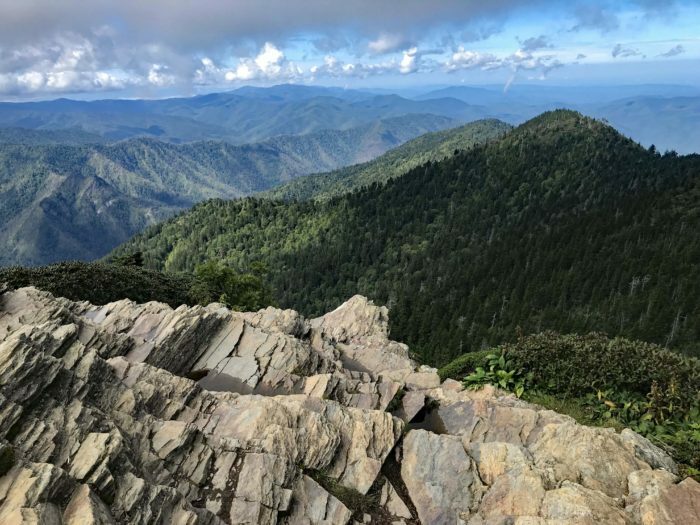 Many readers of this website are intimately aware of the 70 miles of the AT that travel through Great Smoky Mountains National Park, but there are many more hiking options than just that busy thruway. In fact, there are around 900 miles of trail in the 522,427 acres of protected green space. During the nearly 40 years that Ive been regularly visiting the Smokies, I still havent hiked all the trails. These are a few of my favorite day hikes in the park. If you pull into the park too late in the day for a long hike, or are just looking for a shorter walk that still provides a great view, Chimney Tops is the trail for you. The trailhead is located on Newfound Gap Road (main road through the park) about halfway between the Gatlinburg entrance and Newfound Gap (where the AT crosses). The trail has changed significantly in recent years. Many of the steeper sections were rebuilt with (quite a few) steps. 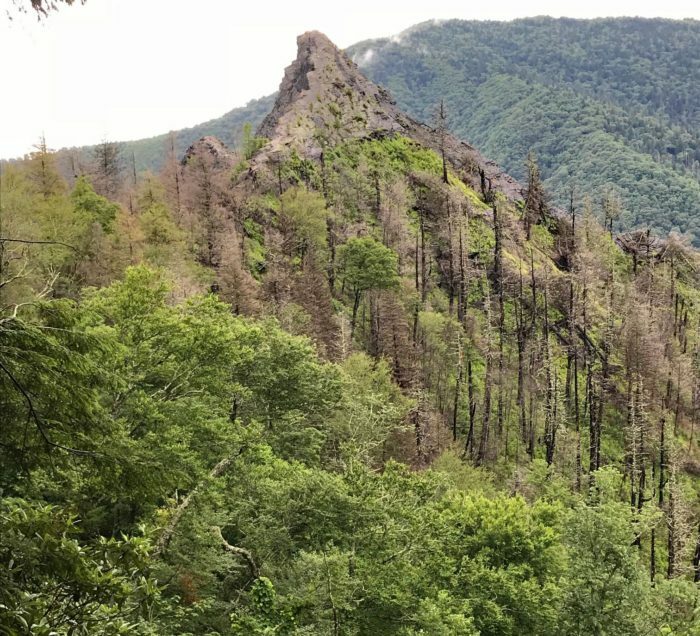 In addition, due to damage from the massive fire in the area in November 2016, the trail now ends short of the actual Chimney Tops, but they are still in view. High water on the Little Pigeon River. 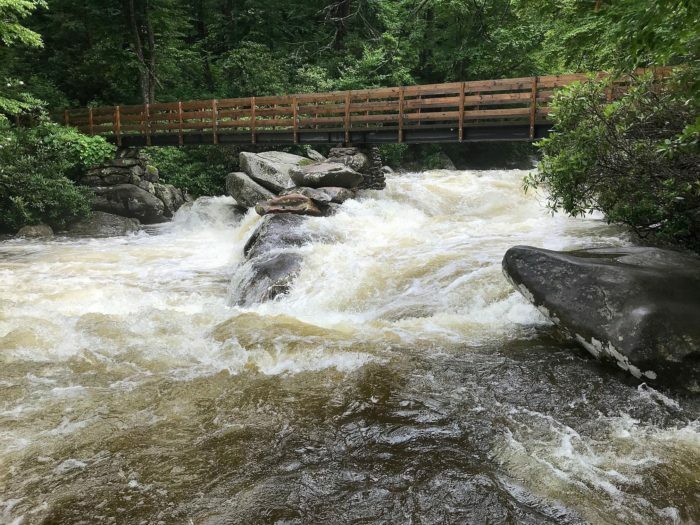 From the trailhead, the path drops quickly to bridge crossings of two prongs of the Little Pigeon River. After that, the trail starts climbing, and continues to climb for the rest of its length, rising about 1,300 feet in 1.5 miles. The climb is enough to change the weather. On one winter hike I left the trailhead in rain, transitioned into snow, and broke through the clouds into blue sky near the top; only to reverse the process on the way down. Once youre done climbing at around 4,700 feet, the trail ends at a well-designed overlook. Chimney Tops is to the left and across the valley stands impressive Mount Le Conte. 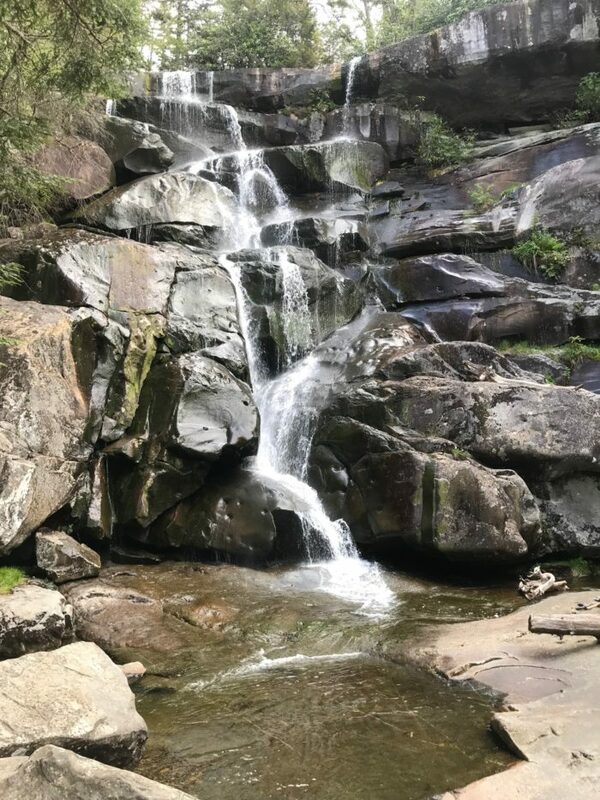 At 100 feet, Ramsey Cascades is the tallest waterfall in GSMNP, and when it is flowing well, possibly the most spectacular. It sits at the end of a four-mile uphill climb in a fairly remote portion of the park. To get to the trailhead, head east out of Gatlinburg on Route 321 for around six miles. Turn right into the park at the Greenbrier entrance. This gravel drive is a bit of adventure itself as it spends the next several miles deteriorating before petering out altogether at the trailhead. The trail spends most of its four miles climbing, gaining a total of 2,200 feet. A highlight is walking through the largest section of old-growth forest in the park. Look for huge cherry and hemlock trees, but the biggest are massive tulip poplars growing right alongside the trail. Enjoy the view from the bottom of Ramsey Cascades. More than a few people have died attempting to scale the cascade. If you want the challenge of a big climb with a big view reward, tackling Mount LeConte via the Rainbow Falls Trail might be for you. The trailhead is less than three miles from downtown Gatlinburg on Cherokee Orchard Road and sits at an elevation of 2,500 feet. The peak is over 4,000 feet taller at 6,593. Due to major reconstruction, the trail is now only open on Friday through Sunday each week, but the improvements are remarkable. The trail crew, without heavy machinery, has rearranged stones in ways that would impress the ancient Egyptians. (As theyve been dead for thousands of years, I feel confident that my statement will not be proven wrong.) Check out the stone bridge at the base of Rainbow Falls. Its almost as impressive as the falls themselves. The trail also passes through some of the area affected by the recent wildfires. The damage, as well as the beginnings of regeneration, are a sight to see. 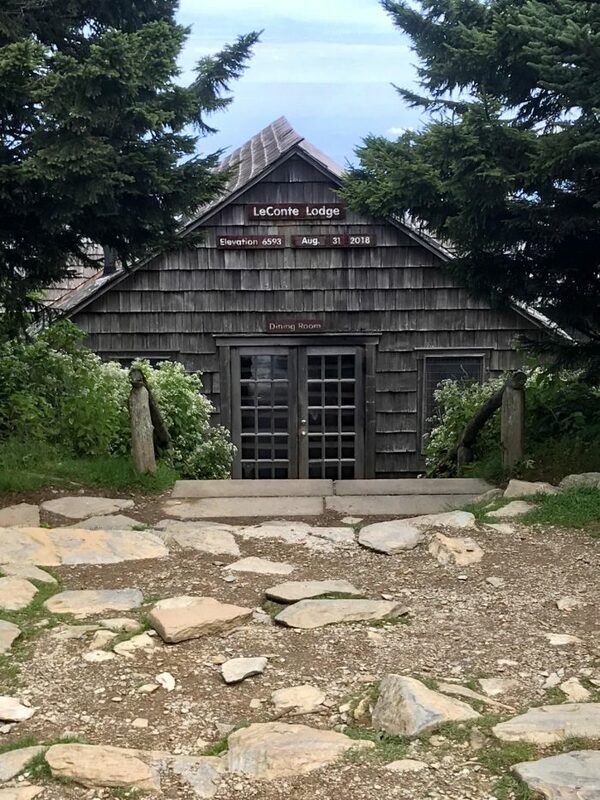 Near the top, youll pass by LeConte Lodge, the highest guest lodge in the eastern US. Overnight accommodations are available for those that plan ahead, but as a day hiker, keep walking. (You can stop for a sandwich or a drink.) When you see the sign for Cliff Tops, take that side trail. While its not the absolute high point, it is the best view in the area and one of the best in the park. For some new views, its possible to return via Trillium Gap Trail. This option adds about two miles to the day, but also includes some new sights. One highlight is Grotto Falls, where the trail goes completely behind the water flow. Perhaps you answer this on your website but what part of Ohio…as a person who got their first taste of hiking (and skipping school) in the Hocking Hills area, just curious…Happy Trails. I’m from the Cincinnati area. My first backpacking trips were to Zaleski State Forest and Shawnee State Forest. I’m from Asheville, NC – just over the boarder to the Smoky Mountains, I am sure there are great trails in park, to which I DO NOT HIKE!!! They don’t allow dogs…let me repeat that “they don’t allow dogs”…really!!!! this is the outdoors people!!! 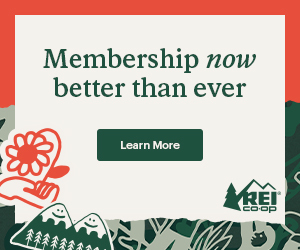 one of the stupidest rules I have ever heard of….If you want great hiking with your dog then come across the boarder into North Carolina for unrestricted hiking with your best friend and 4-legged hiking companion.. We like dogs over here!!! AREA ENOUGH TO RECONSIDER THAT STUPID DOG RULE!!! !